2019 Jeep Compass Latitude 4x4 Automatic - $0 cash or trade down. 42-Month lease with 10,000 miles per year. Offers do not combine. First payment, bank fee, applicable taxes, title, license, and dealer fees not included. See dealer for complete details. Includes all avaliable rebates to dealer. Offer ends 4/30/2019. 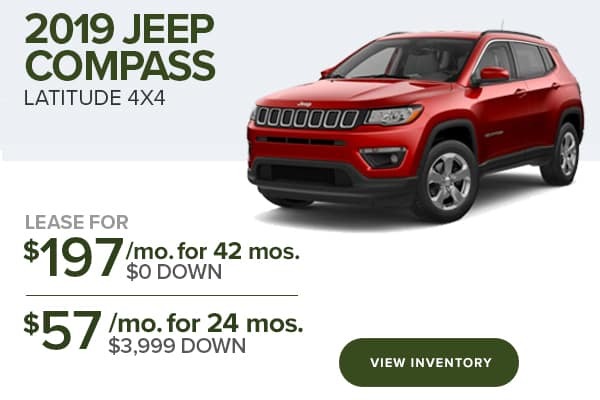 2019 Jeep Compass Latitude 4x4 Automatic - $3,999 cash or trade down. 24-Month lease with 10,000 miles per year. Offers do not combine. First payment, bank fee, applicable taxes, title, license, and dealer fees not included. See dealer for complete details. Includes all avaliable rebates to dealer. Offer ends 4/30/2019. 2019 Jeep Grand Cherokee Laredo 4x4 Automatic - $0 cash or trade down. 42-Month lease with 10,000 miles per year. Offers do not combine. First payment, bank fee, applicable taxes, title, license, and dealer fees not included. See dealer for complete details. Includes all avaliable rebates to dealer. Offer ends 4/30/2019. 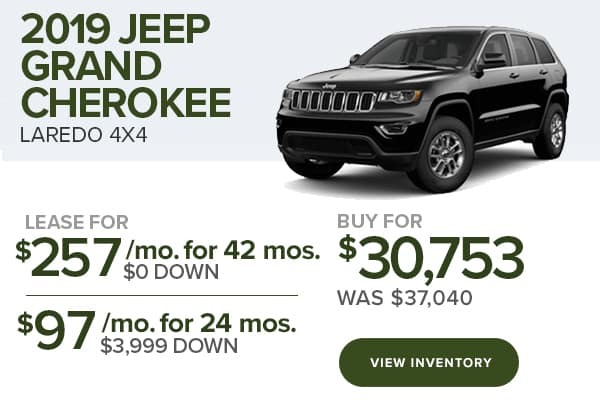 2019 Jeep Grand Cherokee Laredo 4x4 Automatic - $3,999 cash or trade down. 24-Month lease with 10,000 miles per year. Offers do not combine. First payment, bank fee, applicable taxes, title, license, and dealer fees not included. See dealer for complete details. Includes all avaliable rebates to dealer. Offer ends 4/30/2019. 2019 Jeep Cherokee Limited 4x4 - $0 cash or trade down. 42-Month lease with 10,000 miles per year. Offers do not combine. First payment, bank fee, applicable taxes, title, license, and dealer fees not included. See dealer for complete details. Includes all avaliable rebates to dealer. Offer ends 4/30/2019. 2019 Jeep Cherokee Limited 4x4 - $3,999 cash or trade down. 42-Month lease with 10,000 miles per year. Offers do not combine. First payment, bank fee, applicable taxes, title, license, and dealer fees not included. See dealer for complete details. Includes all avaliable rebates to dealer. Offer ends 4/30/2019. 2019 Ram 1500 Quad Cab 4x4 Automatic - $0 cash or trade down. 39-Month lease with 10,000 miles per year. Offers do not combine. First payment, bank fee, applicable taxes, title, license, and dealer fees not included. See dealer for complete details. Includes all avaliable rebates to dealer. Offer ends 4/30/2019. 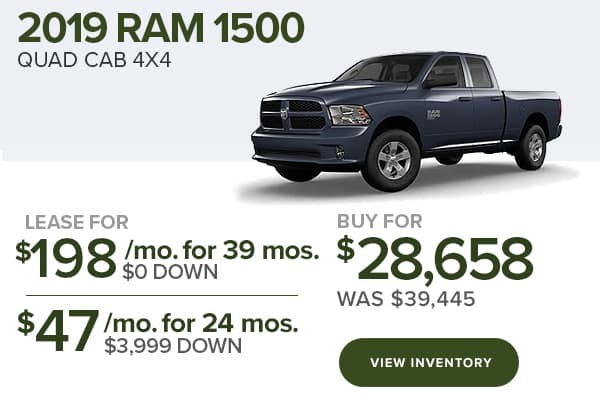 2019 Ram 1500 Quad Cab 4x4 Automatic - $3,999 cash or trade down. 24-Month lease with 10,000 miles per year. Offers do not combine. First payment, bank fee, applicable taxes, title, license, and dealer fees not included. See dealer for complete details. Includes all avaliable rebates to dealer. Offer ends 4/30/2019. 2018 Jeep Wrangler Sport Unlimited 4x4 Automatic - $0 cash or trade down. 48-Month lease with 10,000 miles per year. Offers do not combine. First payment, bank fee, applicable taxes, title, license, and dealer fees not included. See dealer for complete details. Includes all avaliable rebates to dealer. Offer ends 4/30/2019. 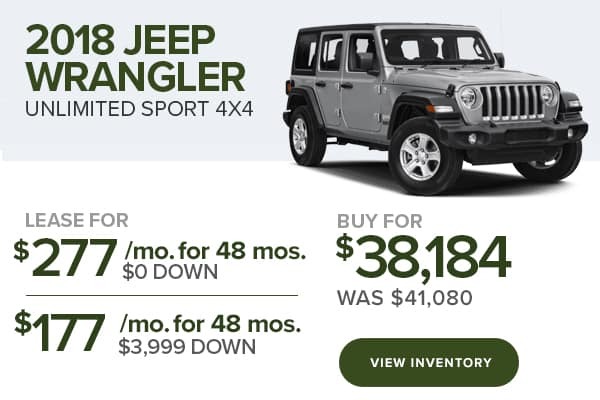 2018 Jeep Wrangler Sport Unlimited 4x4 Automatic - $3,999 cash or trade down. 48-Month lease with 10,000 miles per year. Offers do not combine. First payment, bank fee, applicable taxes, title, license, and dealer fees not included. Includes all avaliable rebates to dealer. See dealer for complete details. Offer ends 4/30/2019. 2018 Promaster City Cargo Van - Offers do not combine. First payment, applicable taxes, title, license, and dealer fees not included. See dealer for complete details. Includes all avaliable rebates to dealer. Offer ends 4/30/2019. 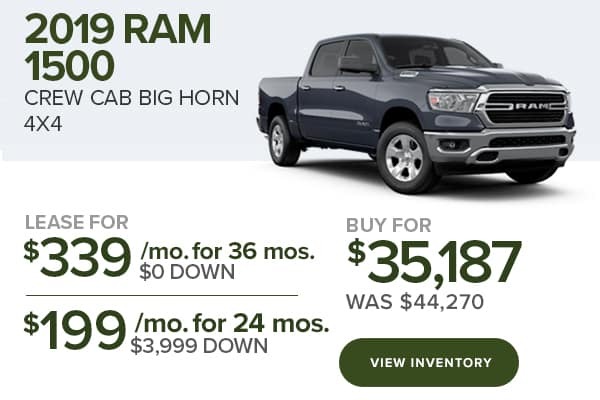 2019 Ram 1500 Crew Cab Big Horn 4x4 - $0 cash or trade down. 36-Month lease with 10,000 miles per year. Offers do not combine. First payment, bank fee, applicable taxes, title, license, and dealer fees not included. See dealer for complete details. Includes all avaliable rebates to dealer. Offer ends 4/30/2019. 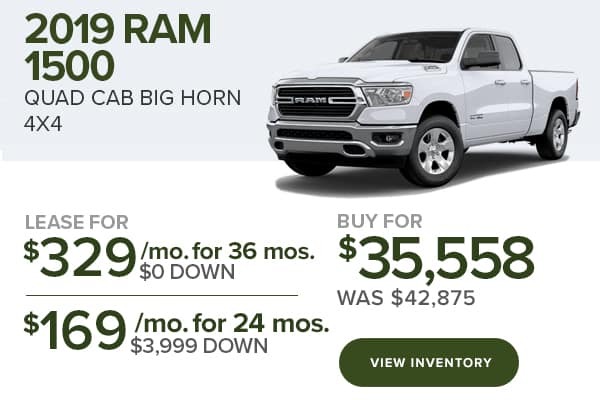 2019 Ram 1500 Crew Cab Big Horn 4x4 - $3999 cash or trade down. 24-Month lease with 10,000 miles per year. Offers do not combine. First payment, bank fee, applicable taxes, title, license, and dealer fees not included. See dealer for complete details. Includes all avaliable rebates to dealer. Offer ends 4/30/2019. 2019 Ram 1500 Quad Cab Big Horn 4x4 - $0 cash or trade down. 36-Month lease with 10,000 miles per year. Offers do not combine. First payment, bank fee, applicable taxes, title, license, and dealer fees not included. See dealer for complete details. Includes all avaliable rebates to dealer. Offer ends 4/30/2019. 2019 Ram 1500 Quad Cab Big Horn 4x4 - $3999 cash or trade down. 24-Month lease with 10,000 miles per year. Offers do not combine. First payment, bank fee, applicable taxes, title, license, and dealer fees not included. See dealer for complete details. Includes all avaliable rebates to dealer. Offer ends 4/30/2019. 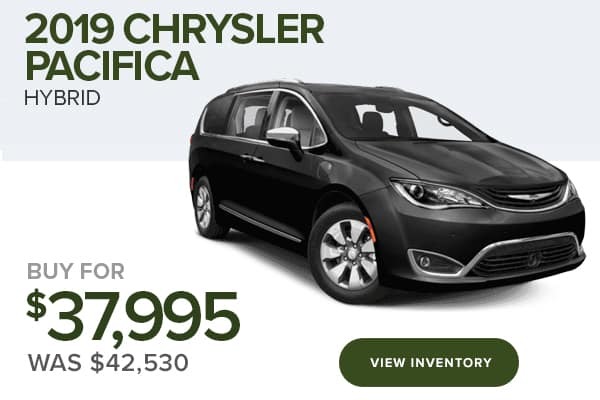 2019 Chrysler Pacifica Hybrid Automatic - Offers do not combine. First payment, applicable taxes, title, license, and dealer fees not included. See dealer for complete details. Includes all avaliable rebates to dealer. Offer ends 4/30/2019. 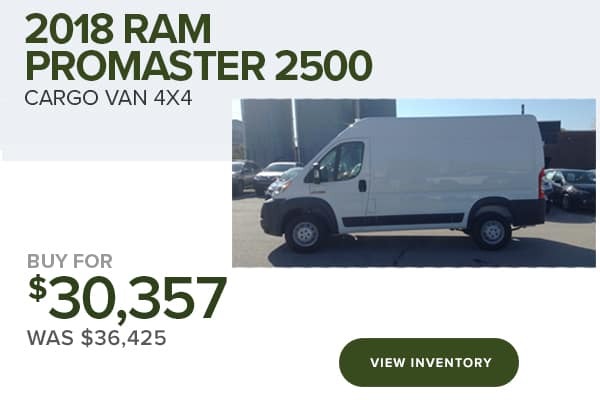 2018 Promaster 2500 Cargo Van - Offers do not combine. First payment, applicable taxes, title, license, and dealer fees not included. See dealer for complete details. Includes all avaliable rebates to dealer. Offer ends 4/30/2019.